Investigate alternatives in school bus fuel technology to position Washingtonville Central School District as a leader in environmental initiatives and a model for the community. Annual fuel savings of about $21,000 per year for the autogas fleet. 30 percent less spent on routine maintenance expenses per year for the autogas fleet. About 120,000 pounds of carbon dioxide per bus eliminated from Washingtonville’s carbon footprint, during the lifetime of the vehicle. 20 percent of their total bus fleet runs on propane autogas, increasing to 30 percent by the 2014-2015 school year. In New York, Washingtonville Central School District transports more than 5,000 students to 28 Orange County area schools, including public, private and parochial. Of their 89-bus fleet, 18 are fueled by propane autogas. Washingtonville was the first district in the county to purchase buses fueled by autogas. The autogas buses travel an average of 450 miles per week, or 18,000 miles per school year. During the summer they transport students to camps and on day trips. 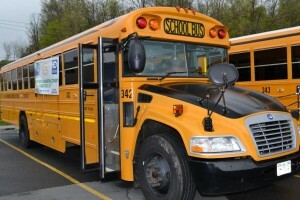 When Washingtonville Schools decided to purchase propane autogas school buses, they found the cost about 9 percent more compared to the same diesel model. Their goal — to recoup that incremental cost within one year — was accomplished through the immediate savings from both the fuel and routine maintenance expenses. On average, the school district spends 40 to 45 percent less per gallon for autogas than diesel. Currently, they pay $1.70 for autogas and $3.18 for diesel. The district completes routine maintenance, such as oil and filter changes, every 7,500 miles on their autogas buses, compared to every 5,500 miles for their diesel buses. Each service costs, on average, 5 cents per mile for autogas and 13 cents per mile for diesel. Overall, the school district has experienced a 30 percent decrease in routine maintenance expenses. Stringent emissions standards set by the Environmental Protection Agency require additional systems on diesel buses, including diesel exhaust fluids and diesel particulate filters. Due to the fuel’s clean operational properties, autogas buses do not require any additional emissions equipment. Blue Bird buses equipped with ROUSH CleanTech propane autogas fuel systems reduce carbon monoxide, nitrogen oxide and total hydrocarbon emissions, and virtually eliminate particulate matter, when compared to conventionally fueled school buses. The buses meet Environmental Protection Agency and California Air Resources Board certification standards and all federal motor vehicle safety standards. It is estimated that Washingtonville School’s current autogas fleet will emit 2.2 million fewer pounds of carbon dioxide into the atmosphere over the lifetime of the 18 buses. “Environmental reasons were a large part of our decision as much as cost savings. Our district always strives to be good corporate citizens,” said Nienstadt. Other district initiatives include an aggressive recycling program and solar paneling for the high school. Before choosing to fuel with autogas, a team from Washington Schools visited three school districts operating alternative fuels. Once the decision was made to deploy autogas, the school district installed an on-site fueling station at the school bus depot. Their local propane distributor provided a 1,000-gallon tank and fuel dispenser at no charge. The school district assisted by pouring the concrete base during the summer when school was not in session. Their propane provider maintains the station at no charge. By comparison, a diesel fuel tank replacement for their diesel station costs the school district $100,000. The fuel provider also certified Perez to train additional drivers in refueling. The drivers have experienced other benefits, too. In the winter, the heat comes on fast, which makes both the drivers and students comfortable. And, the “pep” of the bus, as Mora describes it, helps the vehicle move within traffic and keep up with traffic flow. Neighboring communities have taken notice of the transition from diesel-fueled buses to clean-burning propane autogas models. “Washingtonville has been approached by at least five other school districts in Orange County that are considering autogas,” said Nienstadt. 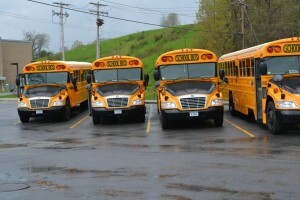 The Washingtonville school board continues to support new purchases of autogas school buses. According to the local newspaper, Times Herald Record, school board member Bill Santos said that the district hopes to eventually replace the whole diesel fleet [with propane autogas buses]. And in fact, the school district presented an award for excellence to head mechanic Ralph Perez, largely due to his initiative to incorporate alternative fuel into the district’s school bus fleet. Nine more autogas school buses have been ordered for the 2014-2015 school year. About Blue Bird: Blue Bird offers a complete line of Type A, C and D school buses in a variety of options and configurations. For more than 85 years, Blue Bird Corporation has continued to set industry standards with its innovative design and manufacturing capabilities. Additionally, Blue Bird provides comprehensive financial solutions through Blue Bird Capital Services. Today, Blue Bird has more than 1,500 employees, Georgia-based manufacturing facilities and an extensive network of dealers and service-parts facilities throughout North America. Its global presence can be seen in more than 60 countries through sales into Africa, Asia, the Caribbean, Latin America, Europe and the Middle East. For more information, visit blue-bird.com. About ROUSH CleanTech: ROUSH CleanTech, an industry leader of alternative fuel vehicle technology, is a division of ROUSH Enterprises based in Livonia, Mich. ROUSH CleanTech designs, engineers, manufactures and installs propane autogas fuel system technology for light- and medium-duty Ford commercial vehicles, and Type A and Type C Blue Bird school buses. As a Ford QVM-certified alternative fuel vehicle manufacturer, ROUSH CleanTech delivers economical, clean and domestically produced fueling options for fleets across North America. Learn more at ROUSHcleantech.com or by calling 800.59.ROUSH.